"12 Angry Men" performed by 12 impassioned women. “12 Angry Men” is a landmark case study in justice, innocence vs. guilt and the class system. The play (turned 1957 film) follows 12 jurors all assigned to a case in which a teenage boy is being charged with the murder of his abusive father. While the guilty verdict seems clear given the evidence presented during the trial, one juror seeks to dig up the truth and, in doing so, manages to change the minds of all those around him. Notably missing from the story, and the title, are women. The reason is simple; in 1954, when the play was written, women weren’t allowed to serve on a jury (a right that came 19 years later). Over the weekend, hundreds of women honored those who came before them and were denied this right by performing “12 Angry Men” with entirely female casts. As a part of the “12,000 voices” initiative, SUNY New Paltz hosted “12 Angry Men Performed by 12 Impassioned Women” on Sunday, April 7. The initiative included over 50 readings of the play, spanning across the United States and Canada from April 5-8. Here at New Paltz, the cast included students, alumni, faculty and even Sandy Christian, wife of President Donald Christian. Directed by Sandie Luna, the reading came together in a fairly short amount of time, with Associate Chair of the Theatre Arts department Connie Rotunda working on casting. On Sunday morning, the cast met for the first time to do their first and only practice read-through of the material, as well as incorporate some light blocking and directions (due to the nature of this performance, most of the play was read while seated). In September of 2018, founder of “12,000 Voices” Lauren Class Schneider put together a reading of “12 Angry Men” with a cast comprised of 12 female Broadway performers. In her note on the initiatives website, she states that the event “struck a chord,” and inspired her to expand it nationally. At New Paltz, the reading was a powerful, moving display. None of the original source material was changed, including pronouns, though the female representation was clear and present on stage. 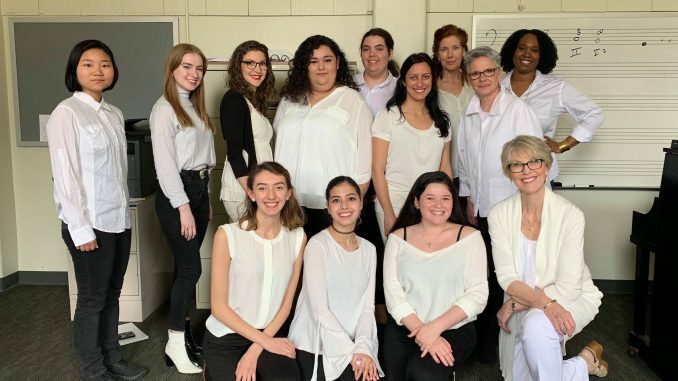 “On a basic level, [the all-female cast] shows how the judicial system, in terms of who was and was not allowed to serve on a jury then as opposed to now, has changed,” said Bria Walker, associate professor of theatre. After the reading, Walker admitted to the crowd that, though her character was the protagonist of the story, she didn’t necessarily relate to him. The ability and willingness to really analyze something and speak up for what you believe in when you are the only one who feels that way is a challenge that takes a lot to do.